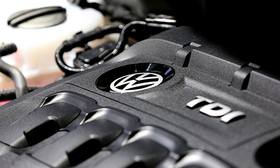 WASHINGTON — Volkswagen said the U.S. Securities and Exchange Commission may bring an enforcement action over the automaker's diesel emissions scandal. The company said in its annual report released earlier this week that the SEC probe focuses on the automaker's nondisclosure of "certain Volkswagen diesel vehicles' noncompliance" with U.S. emissions rules. The automaker has agreed to pay more than $25 billion in the United States for claims from owners, environmental regulators, states and dealers, and has offered to buy back about 500,000 polluting U.S. vehicles.